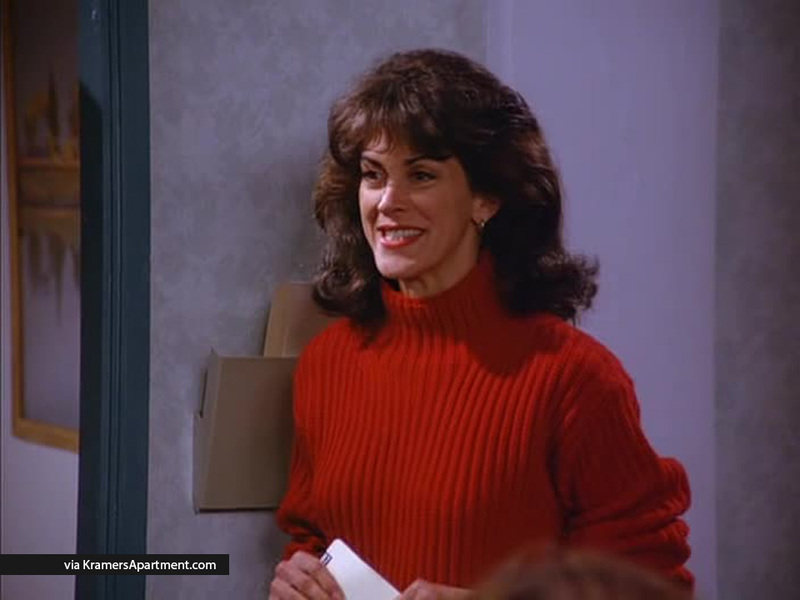 At Jerry’s apartment, Elaine introduces Wendy to Kramer, hoping that he will mention her outdated hair, but instead Kramer tells her that he loves it. Later Kramer tells Jerry that he broke up with Wendy because she changed her hairstyle. George: You’re uh, physical therapist, right? 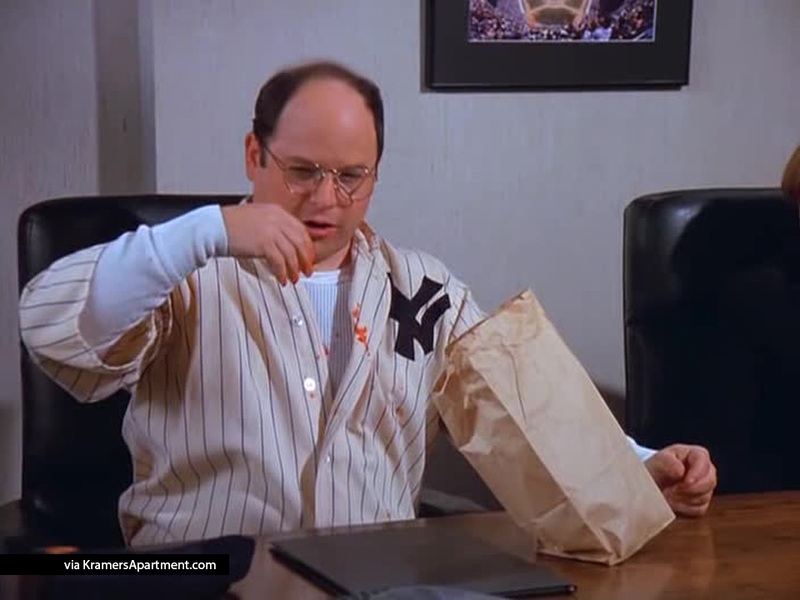 George: You know, I got this little swelling right here. It’s kinda painful. What d’you make of it? Wendy takes a brief glance at George’s proffered limb. Elaine isn’t happy that George is bothering Wendy. Wendy: Have you tried heat and ice on it? George: Oh that uh, that seems like a lotta trouble. Wendy: Well, you could come by my office later, I could work on it for you a little. Wendy: Let me give you my card. Kramer: You know, I really like that hairdo. Wendy: Oh. Thank you. I actually was thinking it might be time for a change. 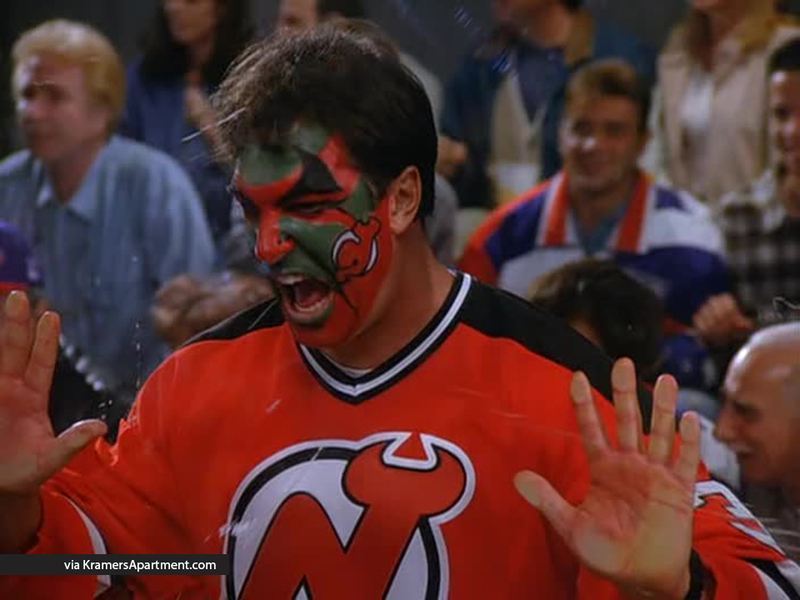 Kramer: Oh, no no no. You don’t wanna do that. No no. Nobody wears it like that. 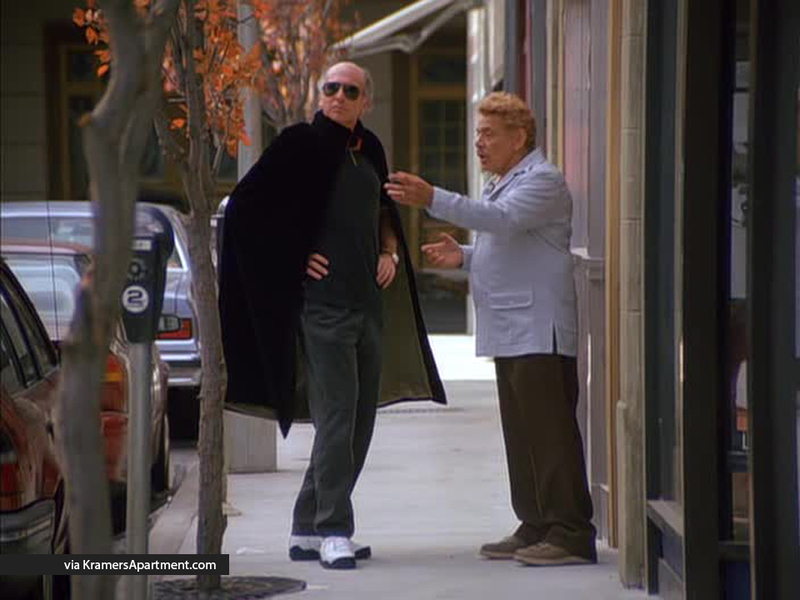 Kramer: No, no. you’d be a damn fool to change it. It’s very becoming. Wendy: So, who’s that friend of yours? That guy that came in. Wendy: Yeah. Does he have a girlfriend? Elaine: You wanna go out with him? Wendy: What, is there anything wrong with him? Elaine? Elaine: I’m just thinking about the question. Wendy: I am really glad I took the day off. Elaine: Oh, yeah, there’s nothing better than skiing. Wendy: Yeah. I hope my clients weren’t too upset. Elaine: Ugh, the hell with ’em. What’re you stopping here for? Wendy: I’m dropping you off. Elaine: Oh, no, I’m three more blocks. Elaine: Yeah, but it’s only three blocks. Wendy: Right. It’s only three blocks. Wendy: I’m sorry, I don’t owe you anything. I had some personal business that day. George: Oh, I see. So your time is more valuable than mine. Is that it? You’re a delicate genius! Elaine: Wendy, I injured my shoulder, Wednesday, when You dropped me off and I had to carry my skis, and my boots, and my poles and everything, all the way home. I’m, I’m having trouble lifting my arm. Do you think you could give me some treatment? Wendy: Oh sure. You have insurance, right? Elaine: Insurance? You’re charging me? George: Wednesday? That’s your personal business?! Skiing?! So let people suffer, while you’re shushing all over a mountain? Wendy: How did you hear that? Wendy: I mean, why don’t you two just take your business elsewhere, hmm? Elaine: Oh, huh huh, that is a good idea. C’mon George. Elaine: And you know, you might wanna do something about that hair. Wendy: Why, what’s wrong with my hair? Elaine: Huh, I think it’s a little old-fashioned. Don’t you? Uh, tell her.